Many of the candles are made using our own beeswax which we harvest from The Hive apiaries, which is an unaffected & renewable resource, working alongside nature. These fine small tealights burn a clear clean flame and give off a faint hint of honey as they burn. No toxic flumes as with paraffin candles. We also sell a glass containers/holder that fit this candle perfectly! See under candles- GLASS TEALIGHT HOLDER for details. This is a clear glass holder designed to have a tea light placed into it and contains the melted wax as the tea light burns. 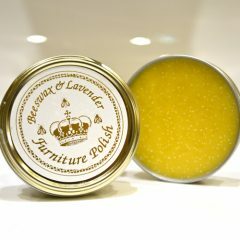 Beeswax Lavender Polish- OFFER PRICE! Made with pure beeswax from our orchard hives. I render my family polish mix and hand ladle it into each round tin. Every polish is hand made using the raw beeswax from my own hives. Our furniture polish is wonderful to help nourish dry, brittle wood back to health. Then in keeping with the true Victorian recipe, I add pure Lavender oil, which is said to keep moths & woodworm at bay! Unlike spray polishes, beeswax polish will buff up time after time and does not yellow. Our polish is clear, no dyes are used. Good for all types of new or fine antique woods. REMEMBER: Keep out of reach of Children. Beeswax polish builds up layers each time you polish, so eventually the wood stops absorbing the polish and you get a great protective outer layer that just needs the occasional light buffing. We polished our antique church pew and the result is amazing-see photo. 100% pure, unadulterated English Beeswax. Our beeswax is FOOD GRADE rated as we do not add chemicals, bleaches or sugars. It is hand scraped from our beehives and wide filtered through cotton muslin using only steam. The colour may vary as we do not tamper unnecessarily with the wax, just steam melt, filter and cast them into 30g. bars. They make a fabulously natural base for making your own cosmetics or polish as well. 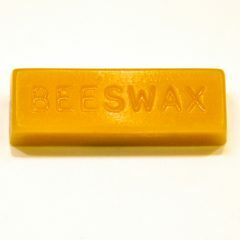 Our beeswax is food grade rated as we do not add chemicals, bleaches or sugars. It is hand scraped from our beehives and wide filtered through cotton muslin using only steam. • Sewing Thread, To Strengthen & Water Proof It. REMEMBER: Seek expect advise if melting beeswax as it has a low flash point! Never leave alight while unattended. Children should only light a candle under adult supervision. Always burn on a heat resistant surface. Keep out of draughts, keep the wick trimmed. 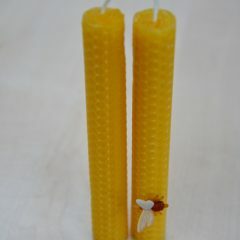 This is a lovely pair of hand made pure virgin sweet beeswax candles. Each candle has the embossed hexagonal honey cell design. Care is taken with each candle handmade by us. Comes with a little plastic bee pin! Wrapped ready to give or receive. REMEMBER: Never leave alight while unattended. Children should only light a candle under adult supervision. Always burn on a heat resistant surface. Keep out of draughts, keep the wick trimmed. Made of pure 100% English Beeswax. Each candle has the embossed hexagonal honey cell design. Each candle is Hand Rolled by us! In days long ago, beeswax was highly prized by all who could afford it. Monasteries kept bees more for the beeswax than the honey & often required to be paid in beeswax, such was its value. In its antiquity the Church sought only the purist source of light for its religious ceremonies. Beeswax is created by young ‘virgin’ female bees.The wax thus coming from a pure source was selected by the Church. 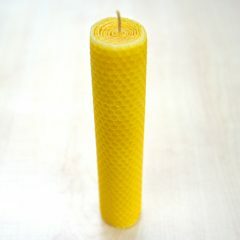 A chunky tall pure 100% beeswax candle. Beautiful when lit. Remember beeswax is just flower nectar that bees have converted into wax. 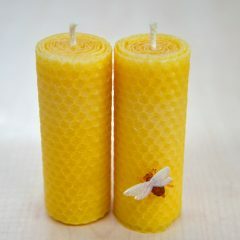 Unlike Paraffin candles that can cause health problems when inhaled, beeswax is 100% natural and safe. 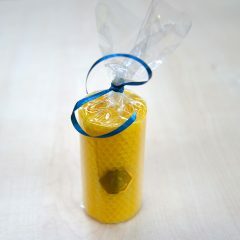 Comes presented in a clear cellophane wrapper with a yellow bow. Made of 100% pure English Beeswax. Each candle has the embossed hexagonal honeycomb cell design. Each one Hand Rolled by us! Comes presented in a clear cellophane wrapper with a little plastic bee pin free! In days long ago, beeswax was highly prized by all who could afford it. Monasteries kept bees more for the beeswax than the honey & often required to be paid in beeswax, such was its value.In its antiquity the Church sought only the purist source of light for its religious ceremonies. Beeswax is created by young ‘virgin’ female bees.The wax thus coming from a pure source was selected by the Church. Made of pure English Beeswax. Each candle has the embossed hexagonal honey cell design. Each one Hand Made by us! Comes presented in a clear cellophane wrapper with a little plastic bee pin free! These candles are 100% Pure Beeswax. Wrapped in clear cellophane for freshness. Pure beeswax is in fact nectar. The bees gather nectar from different flowers and trees, and through a chemical change within the bee it produces the wax. It is the beekeepers task to remove by hand any extra or old wax from their hives, and with the aid of a solar extractor, (Simply a wooden box with double glazing) uses the heat from the suns rays to melt and naturally lighten the wax. The wax is then strained through a fine muslin cloth many times to remove any foreign matter. Bees have to consume 7lbs. of honey to produce one lb. of wax. It takes 10.000 bees working for three days to produce that one lb. of wax. Made with pure English Beeswax from our apiary at the Surrey Orchard site. Each Candle is single cast. Burning time approx.3-4 hrs. Pure 100% beeswax. 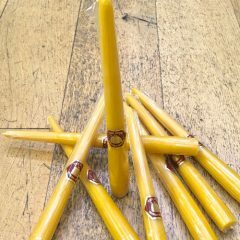 These are mini tapers traditionally used as Christmas tree candles. They work well for centre dinning table displays. We stand them upright them in a bowl of sand covered in fresh cut flowers. It looks amazing. 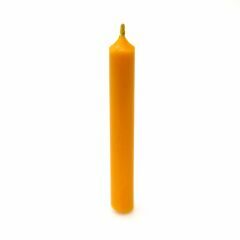 Beeswax candles are healthier than paraffin candles that give off petrol fumes as they burn. Price is for a single candle. Photo for reference only. Approx 10cm tall x 1.25cm dia. price per single candle.